Oxford won the toss and their President Ben Myers (pictured left) chose the Surrey station - always the safer option despite the last four Boat Races having been won on Middlesex. As the crowds waited in keen anticipation of the race, the afternoon suddenly cooled and a south westerly breeze blew up, creating chilly conditions for spectators all along the course. The crews warmed up downriver below Putney Bridge before moving up onto the start as 5pm approached, and as the flotilla of launches jockeyed for position on the incoming tide umpire Rob Clegg dropped his red flag and the 157th Boat Race was under way. 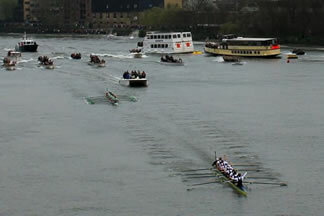 Cambridge rated 47 strokes a minute on the Middlesex station against Oxford at 46, with honours even as both crews reduced their rates approaching the boathouses on Putney Embankment. The Dark Blues had the edge after the first minute, still rating 39 with Cambridge at 38, but approaching Fulham football ground it was Oxford who were warned twice by the umpire. Despite the blip their cox Sam Winter-Levy took them back on course and they maintained the advantage, and with both crews rating 35 Oxford reached the first timing position at the Mile in 3 mins 49 secs, one second ahead of the opposition. Passing Harrods Repository Oxford began to build their attack to create the key point of the race. Packing on the pressure, but with a minimal rate increase, they began to ease away to create a three second advantage by Hammersmith Bridge, which they reached in 6 mins 52 secs. Leading the way by just one length at St Paul’s School boathouse they finally broke clear at the top of Chiswick Eyot, still rating 34, while for a brief moment Cambridge raised the rate by one pip and Liz Box steered them tight on the corner to try and claw back the deficit. It was to no avail - the margin between the two crews was six seconds at Chiswick Steps, which Oxford reached in 10 mins 44 secs, looking increasingly confident as they capitalised on their advantage. Cambridge were rating 34 along Corney Reach and gathering themselves for one final push as the final Middlesex bend was in their favour. But with ten seconds dividing the crews at Barnes Bridge, where Oxford’s time was 14 mins 34 secs, Winter-Levy was able to steer where he liked, denying Cambridge the final edge. The Light Blues upped the rate to 36 strokes a minute as the Mortlake Brewery came in sight, but it was too late. Oxford were able to hold them off with ease, crossing the line in 17 mins 32 secs to take a four length verdict over Cambridge, who were 12 secs adrift at the Finish.